Internet search firm Yahoo is reported to be in talks to buy social networking website Facebook for $1bn (£527m). US-based Facebook, popular with students, has also held separate discussions with Microsoft and Viacom, according to the Wall Street Journal. Facebook, which allows users to put up profiles of themselves, recently signed an advertising deal with Microsoft. A similar such website, MySpace, was bought by Rupert Murdoch's News Corporation for $580m last year. 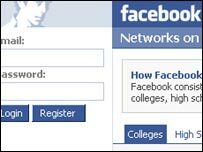 Founded in February 2004, Facebook has quickly grown in popularity, and by the end of 2005 had more than 7.5 million users at US schools and colleges alone. Neither Facebook nor Yahoo were immediately available for comment.